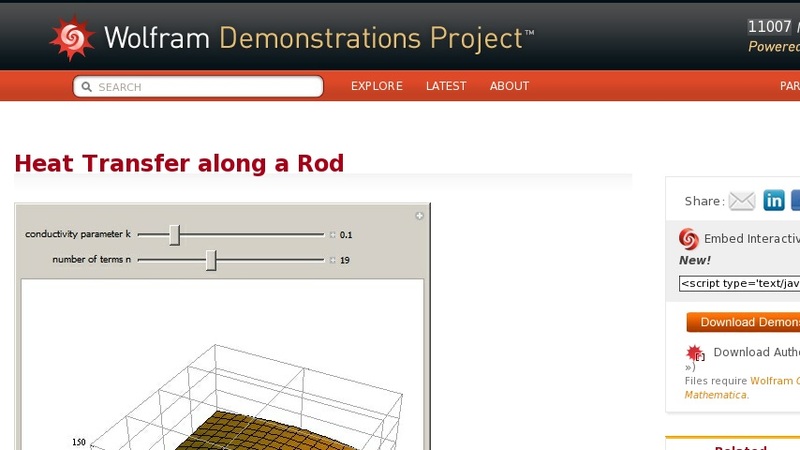 This Demonstration shows the solution to the heat equation for a one-dimensional rod. The rod is initially submerged in a bath at 100 degrees and is perfectly insulated except at the ends, which are then held at 0 degrees. This is a a Sturm–Liouville boundary value problem for the one-dimensional heat equation ... , with boundary conditions ... , ... , and ... , where ... is time, ... is distance along the rod, ... is the length of the rod, and ... . The solution is of the form ... , where ... is the conductivity parameter (a product of the density, thermal conductivity, and specific heat of the rod) and ... . If you increase the number of terms ... , the solution improves as long as the time is small. As ... (the final state), the entire rod approaches a temperature of 0 degrees. You can see the effect of the thermal properties by varying the conductivity parameter ... .